Stealth version available in satin black. Tested to show intake temps just 3 degrees above ambient !!! When Pumaspeed design a new intercooler for any car we never compromise. 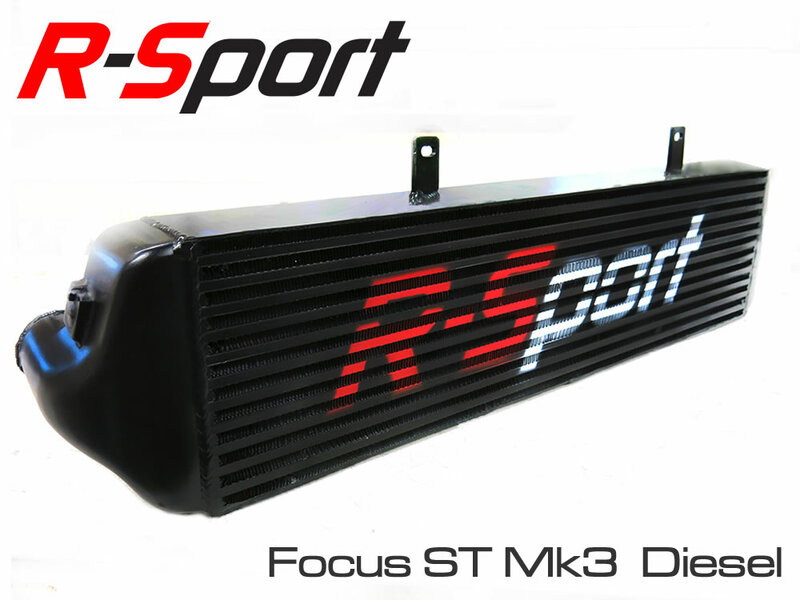 This new R-Sport Focus ST Mk3 Diesel intercooler has a no compromise approach and is a perfect addition for any Mk3 Focus Diesel. Designed to lower air intake temps and withstand the higher boost presures than most all tuned Diesels run, it has the form and function that few others can match. WE were so confident in the quality and function of the Intercooler core that we strapped one to one of our demo cars, a new 430 bhp Focus RS Mk3. We took it to Santa Pod drag strip and ran a flat 12.4 quarter mile time. The Unique R-Sport intercooler fits immediatly behind the front bumper and is in full view of the air flow, it does not hide any of its massive 13.5 litre capacity behind a crossmember. The CAD designed end tanks are the optimum size to keep lag to a minimum whilst flowing air around the 90 degree angle required. The 13.5 litre capacity has run over 400 bhp in testing on other petrol vehicles and is the perfect size to cool and flow the air required. The newest addition to the R-Sport Range will tick all the right boxes on cost, on performance and on looks. What does the Intercooler do ? The R-Sport Range from Pumaspeed Performance offers the perfect mix of high performance cooling at a sensible price. The Ultimate affordable Intercooler kit. The Pumaspeed Workshop team are ready to fit the R-Sport Stage 3 Focus Mk3 ST Diesel Intercooler in our Head Office located here. Therefore making parts and labour a total cost £413.59 (inc. VAT). Pumaspeed have a specialist distribution team that can dispatch the R-Sport Stage 3 Focus Mk3 ST Diesel Intercooler to any destination worldwide.